The time I first heard of Cockle Creek I wanted to go there. It is the southernmost settlement in Tasmania and the furthest point south you can drive to in Australia. To reach this micro-hamlet one travels a narrow road through some of Tasmania’s most beautiful scenery, on the edge of a World Heritage wilderness, to the forested shores of Recherche Bay, where French explorers first met Tasmanian Aborigines. Both the journey and the destination are well worth the efforts. 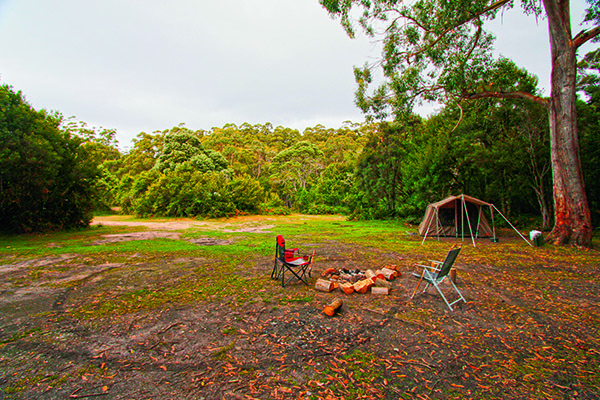 Although it is possible to camp near Cockle Creek, we opted to stay at Dover, which is a beautiful destination in its own right and more centrally placed for exploring the Far South region. Only 85km from Hobart, this picturesque village sits at the head of Port Esperance, a bay that enfolds the small islands of Faith, Hope and Charity. The hinterland skyline is dominated by majestic Adamsons Peak (1226m), whose summit can be reached via a four-hour hike through tall forest and alpine moors. Once a convict probation station (est 1845), Dover is the area’s main service centre, with tourism, apple orchards and fishing its economic backbone. Its Atlantic salmon farm is the largest in the southern hemisphere. The town is a good place to stock up with supplies if you plan to camp further south. Accommodation includes comfortable B&Bs and a selection of self-contained apartments. We chose to stay at the well-appointed Dover Beachside Tourist Park, a quiet, rural setting just a short walk from the township and directly opposite Kent Beach. The park, which boasts ensuite cabins, caters for caravan and camping on an open, grassy meadow. The protected waters of nearby Port Esperance are ideal for swimming, kayaking, and boating, while the foreshore boasts an easy walkway and barbecue shelter. Fishing from the nearby wharf offers the added attraction of spectacular views when dusk paints Adamsons Peak and the placid inlet with a golden glow. This town, about 15km south of Dover, is reached via a very scenic drive through verdant farmlands and forested hills along the Huon Highway (A6). 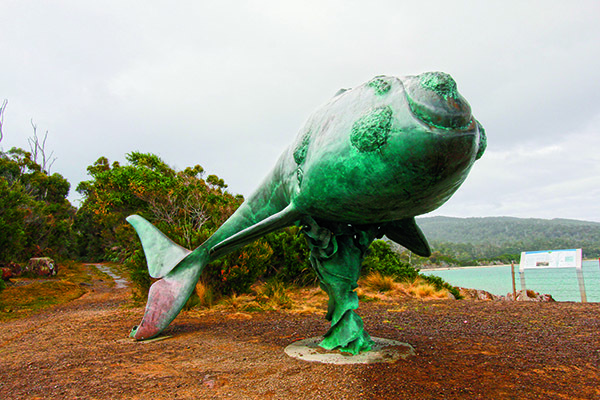 The alternate coastal route, via Lady Bay Road, offers spectacular views across the D’Entrecasteaux Channel to Bruny Island, plus photographic opportunities at secluded Lady and Sisters bays. In 1837, an administrative and military base was established here on the inlet named ‘Baie des Moules’ (Mussel Bay) by French Admiral Bruni D’Entrecasteaux 45 years earlier. The town became a thriving port, catering to whalers and the local timber industry. Fire has destroyed much of the original settlement, with two small cemeteries the only relics of the region’s rich social history. Modern-day Southport is a small community of resident “shackies” and a fluctuating population of holidaymakers drawn by the fishing and beaches. The Southport Hotel and Caravan Park, on 12 acres of native bushland, offers comfortable accommodation and amenities and is the area’s only spot for groceries, fuel and cooked meals. Discerning philatelists can also pick up an unusual collectible at the Post Office: Australia’s southernmost postmark. The original town of Hastings was established in 1868 at Hastings Bay, a large inlet west of Southport. 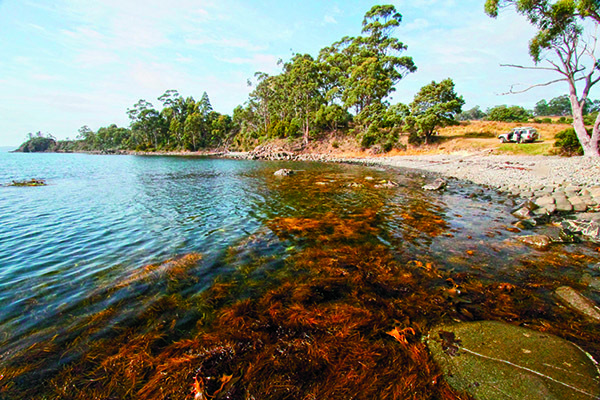 The settlement prospered thanks to timber-getting and had the largest mill in Tasmania, plus a eucalyptus-oil distillery, boat-building and coal mining. There is almost nothing here now, and the whole site would have been reclaimed by bush if timber workers had not discovered three dolomite caves in 1917. The unsealed Hastings Caves Road (C635) heads west into the Hastings Caves State Reserve, which offers the chance to relax in the 28°C waters of a thermal pool, plus forest trails and Newdegate Cave, Australia’s largest dolomite cavern. While there is no camping, excellent day-use facilities include change rooms, hot showers, free electric barbecues, picnic shelters and open fireplaces. The Hastings Forest Drive provides further adventure with a two-hour self-guided tour through Tasmania’s Southern Forests. Beginning at Hastings Caves, the route follows good, but narrow, unsealed roads through old-growth forest to the Esperance River Picnic Area, near Dover. Information signs at stops along the route explain the area’s logging history, with audio guides available at Forest and Heritage Centre in Geeveston. The journey south continues along another minor road (C636), soon reaching the diminutive enclave of Lune River. 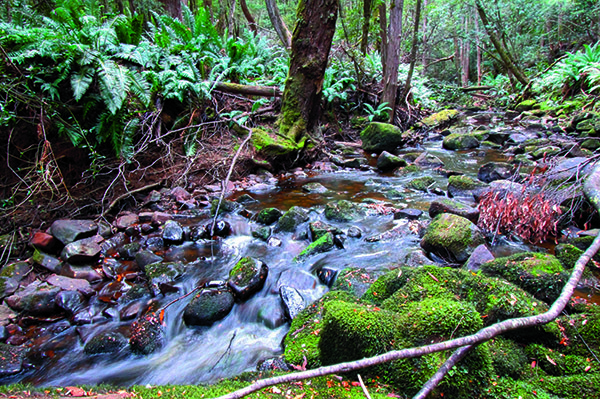 From headwaters in a Southern Ranges glacial valley, the river courses through forested slopes, meanders across button-grass plains and, below the bridge, steadily broadens before reaching the sea at the Narrows, near Southport. This bridge is a good point for launching kayaks to explore downstream and the bays beyond. The Lyluequonny people lived in the region for thousands of years, their occupation evidenced by middens along the coast and shards of the chalcedony (hard, coloured quartz) they used for stone tools and adornment. As the timber industry grew, horse-drawn trolleys brought raw materials from the hinterland to the mills, thence to ships in the lower reaches of Lune River (Ida Bay). More recently, it is the rare silicified fern fossils and semi-precious agates that draw visitors, with two gem fields set aside for fossicking (without permits). Steam engines gradually replaced the horse-drawn trolleys and, one kilometre south of Lune River, the heritage-listed Ida Bay Railway still conveys tourists to Southport Bay. Constructed in 1922, this 14km stretch of two-foot gauge is the last original operating bush tramway in Tasmania and remains Australia’s most southerly. The two-hour return journey meanders through bushland and coastal heath to idyllic Elliott Beach at Deep Hole, where facilities include a weather shelter, barbecues, picnic tables and toilets. During summer (October-April), the historic railway operates seven days a week, with four services departing daily between 9.30am and 3.30pm; during winter the service operates three times a day, four days a week. Passengers who catch an early train can enjoy walks to Southport Lagoon (an easy three hours there and back) and Southport Bluff (four hours). For the more adventurous, another way to access the lagoon is via a 5.9km bush track that begins 1km south of Ida Bay, off the Lune River Road. The track is rated moderate-to-hard and suitable only for experienced drivers, high clearance vehicles and 4WD trailers. There are picnic tables, fireplaces, toilets and a campground near the lagoon’s northwest edge can accommodate 40 people, although there’s a fair chance you’ll have the whole place to yourself. South of Ida Bay, the gravel Cockle Creek Road (C636) traverses the dense myrtle and sassafras forests of Recherche Bay Nature Recreation Area and continues around the bay’s western shoreline, passing a series of free camping areas at Catamaran River, Gilhams Beach and Finns Beach. These open, grassy sites are suitable for tents, caravans and camper trailers, with ready access to pristine beaches and incomparable views of the bay. Bruni D’Entrecasteaux discovered Recherche Bay by accident in April, 1792. On a round-the-world search for the missing explorer La Perouse, his frigates (Recherche and Esperance) were making for Adventure Bay on Bruny Island when struck by a violent storm. A navigational error brought him into the bay, where the expedition dropped anchor for several weeks. After mapping large sections of Tasmania’s east coast, he returned to the bay to replenish water and supplies in January, 1793. In its heyday the Cockle Creek settlement (known as Ramsgate) numbered more than 2000 souls, but the population shrank as good timber became less accessible and coal seams dwindled. Forest regrowth and fire has obliterated the villages and the noise of industry has been replaced by the lapping of waves on the bay’s placid shores. Approaching from the north, the C626 shadows a long, curving beach before crossing Cockle Creek and entering the Southwest National Park, which stretches to the south and west over more than 600,000 hectares. From the Cockle Creek bridge a walking track winds through forest, heathland and coastal scrub to South Cape Bay (moderate, 4 hours return), rewarding hikers with superb views of untamed coast. A Parks & Wildlife cottage stands near the bridge, where information and visitor permits can be obtained. Technically, this is the road’s most southerly point (43° 35’ 00” S 146° 53’ 37” E), before veering a little to the north and the Boltons Green camping area and a carpark, where there is a walking track to Fishers Point. Here you will be closer to Antarctica than Cairns. 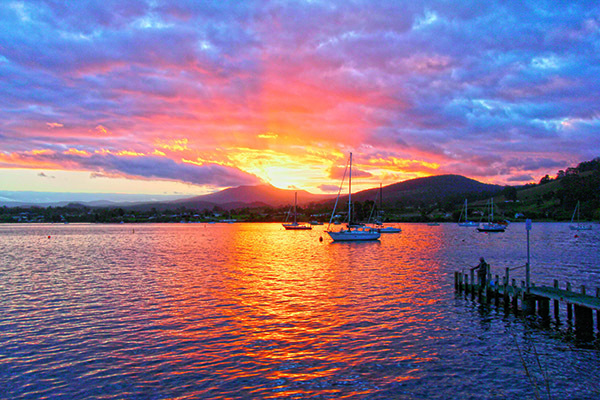 Cockle Creek is 148km south of Hobart on the southwest shore of Recherche Bay, accessed via the Huon Highway (A6) and the C635 and C636 minor roads.